It started with a rolled ankle during a daily run. That’s when undergraduate Jason Moody first thought about the body’s biomechanics. How did his ankle turn, and what did it mean? That question ultimately led him to the Department of Kinesiology, where he conducts research with Associate Professor Christopher Rhea and Assistant Professor Anne Brady. But he didn’t take a traditional path. Student Jason Moody helps conduct trip-training sessions for research participants. Moody unexpectedly stops the treadmill, simulating trips, and records data on how participants – unharmed thanks to the harness – recover. Moody’s winding journey started in high school, where he played football and wrestled. He wasn’t clear on his career goals, but, when he came to UNC Greensboro as a freshman, he decided to major in psychology and minor in theatre. Then, he took a break from school to intern at Walt Disney World, where he honed his communication skills, interacting with a wide variety of people. But Moody knew Disney wasn’t his destiny. As an avid runner, he shifted his focus to health and exercise, wondering whether he could help others live longer, healthier lives. 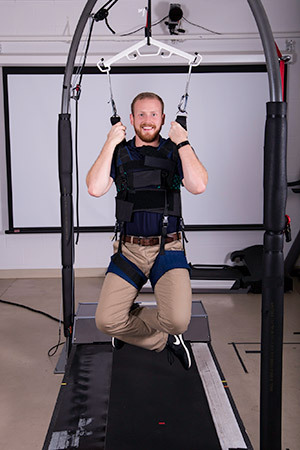 When he – literally and figuratively – stumbled into kinesiology, Moody discovered UNCG has one of the strongest and fastest growing departments nationwide. He returned to campus and jumped into undergraduate research. Now, he works with older adults to improve their physical capabilities and stability. In Rhea’s lab, Moody partners with graduate researcher Brian Cone to help adults over 75 with trip training – an effort designed for fall prevention. Falls are a leading cause of injury and death among older Americans, according to the Centers for Disease Control and Prevention. In 2015, Moody says, the cost related to falls for older adults totaled about $32 billion dollars. The team is testing whether putting participants through a 15-minute trip-training session can help them alter their walking patterns to avoid falls. Trip training provides those situations. Participants wear safety harnesses and motion-recording sensors. Researchers unexpectedly stop the treadmill eight times, simulating trips, and record data on how participants – unharmed thanks to the harness – recover. So far, Moody says, results show a single trip-training session results in gait improvement. This past summer, he also helped Brady collect data at local retirement communities, assessing elements of resident health such as body composition, strength, endurance, and balance. The aim of the project is to better understand the relationship between how older adults perceive their physical capabilities and how they actually perform. The data will also go to the communities’ fitness directors to help them better plan and implement programming for residents. Moody, currently vice president of the UNCG Kinesiology Club and head personal trainer at UNCG’s Kaplan Center for Wellness, has presented his work at UNCG’s Undergraduate Research, Scholarship, and Creativity Expo and at the Human Movement Science and Biomechanics Research Symposium at UNC Chapel Hill. As a next step, he plans to pursue a graduate degree in clinical exercise physiology. He credits much of his success to UNCG’s faculty. In addition, the Dept. of Kinesiology is in the midst of another study that aims to improve the success rates of fall prevention programs for older adults. To learn more about this NIH-funded research, click here. This story, written by Whitney J. Palmer, first appeared in the fall edition of UNCG Research Magazine. Photography by Mike Dickens.